This auspicious yantra is the combination 12+1 yantras i.e Shree Yantra, Vyapar Vridhi Yantra, Baglamukhi Yantra, Navgrah Yantra, Mahamritunajy Yantra, Kaal Sarp Dosh Nivaran Yantra, Saraswati Yantra , Karya Sidhi Yantra, Vastu Dosh Nivaran Yantra, Vahan Durghatna Nashak Yantra, Sukh Smridhi Yantra, Vashikaran Yantra and Sampoorn Mahalakshmi Yantra. 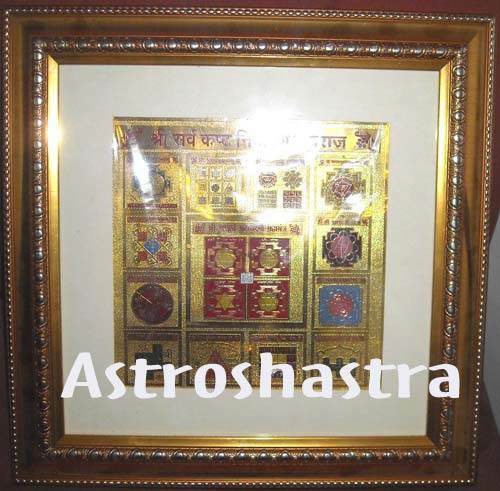 Astroshastra as an effort to provide our customers the best has made Bandhan Mukti Sarv Kasht Nivaran Yantra to remove all obstacles in life, whether caused and planetary position or induced by someone in person, or by tantra. It bestow you with wealth and prosperity. You can place it on the main door of your home or office. You can place it in your Puja Ghar also. A person who regularly woship this yantra gets sure progress in life and new doors to success automatically open for him. Astroshastra would give you the energised yantra to give you maximum benefit in your life. "Mahaalakshmi, Rinn-muktaa, Hiranyamayi, Raajtanyaa, Daaridrya-harinni, Kaanchanaa, Padamaasanaa, Raaj-raajeshwari, Kanakvarnnaa, Varadaa, Jayaa and Sarva Maangalya Yuktaa". Saraswati Yantra - Symobolism of Maa in the form ancient geometry in gold plated copper plate to appease him. Saraswati Puja -is done for a education and career sucess. Four Mukhi Rudraksha - Represent goddess and awaken mind. Some very powerful Combination of Rudraksha beads, which are helpful in gaining the positive effects by appease planets Saraswati Pendant -A combination of two Four mukhi rudraksha and one six mukhi rudraksh. Surya Saraswati Pendant - A combination of Six mukhi , four mukhi and Twelve mukhi Rudraksh beads. 2. An energized Kaalsarp dosh nivaran pendent around their neck to protect themselves from the evil effects of this yoga. 3. Kaalsarp dosh nivaran yantra is also one the most effective remedy for Kaal Sarp Dosh in Horoscope, one Should daily perform puja in front of Yantra and appease the Rahu and Ketu. 4. Wearing Kaalsarp dosh nivaran mala made of Rudraksha Beads is also an effective remedy for removal of Kaal Sarp Dosh in the Horoscope. 5. Wearing Kaalsarp dosh nivaran ring in silver is quiet effective to negate the effects of kaal sarp dosh. Shiva Yantra - Symobolism of Lord Shiva in the form ancient geometry in gold plated copper plate to appease him. Mahamritunjay Yantra - Very effective to free the fear of death, grave dangers, fatal diseases and makes him courageous and healthy. It dispels all sort of fears, influence of evil planets, fear of ghosts accidental death and disease etc. 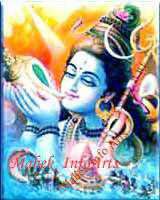 Mahamritunjay Puja -is done for a long and healthy life and to get rid of prolonged sickness.